The SFCB provides free, public entertainment throughout the year at a number of venues around the City of Santa Fe. Many of these performances have become an annual tradition, entwined with the Band’s own history within the City. In fact, while the current adaptation of the SFCB finished its 30th season in 2013, the legacy of the organization reaches back to 1865 and has been part of the City’s story since that time. The band supports the community with holiday performances on the Plaza, New Mexico’s Veterans Memorial Monument, National Cemetery, and at The Lensic theater for our season finale. The Holiday Concert at the Lensic is a Santa Fe tradition. a beautiful Santa Fe afternoon. The Santa Fe Concert Band performs each summer on the green on the east side of the Federal Courthouse in Santa Fe beginning on Mother’s Day and ending in late August. Our park concerts begin at 2:00 pm. The informal setting under the shade of the large trees forms a wonderful place to relive an American tradition of summer band concerts in the park. On Father’s Day, June 21, 2009, there were 378 in the audience and the band of thirty-nine under the direction of Greg Heltman played for one hour. Many in the audience brought blankets to sit on, some just sat on the ground, others had folding chairs, a few sat on the steps of the courthouse, and some at the picnic tables in the park. What a wonderful setting for a band concert, framed by a stone wall and metal pipe railings that follow the outline of the 1883 racetrack. The music was only occasionally interrupted with the competing sounds from traffic on the Federal Oval. 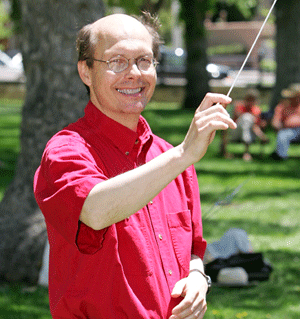 Greg Heltman has been Director of the Santa Fe Concert Band since its start in 1983. A graduate of Santa Fe High School, he holds a music degree from the University of the Pacific. He has been a teacher in the Santa Fe Public Schools since 1989. In 1984 Mr. Heltman founded the Santa Fe Symphony Orchestra, and has been a trumpeter with it ever since. He also serves as the Symphony’s general manager. The Santa Fe Concert Band supports the community at many civic events including the July 4th Pancakes on the Plaza, Veterans Day at the New Mexico Veterans Memorial Monument, and at the National Cemetery on Memorial Day. Los Conquistadores, the predecessor of today’s Santa Fe Concert Band. Los Conquistadores, 1933. Dan McKenzie director with trumpet, first row-lower left. Daniel C. McKenzie was for over 40 years the leader of Los Conquistadores. As a young boy Daniel Catalino McKenzie (b. 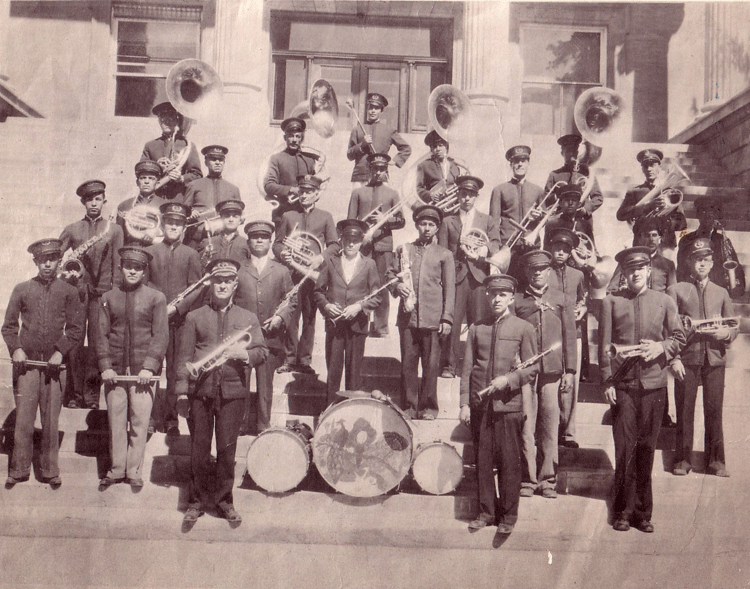 1880; d. January 29, 1949) played trumpet in Professor Francisco Perez’s Brass Band. Perez first organized La Banda de Santa Fe shortly after the end of the American Civil War; this band later became Professor Francisco Perez’s Brass Band and, in 1909, incorporated as Los Conquistadores. McKenzie’s contribution to music in Santa Fe was certainly huge including his role as trumpeter with and then leader of Los Conquistadores. He was also the leader of the bands of St. Michael’s College, the U.S. Indian School, St. Catherine’s school and he helped organize the Santa Fe High School band. He died when he was 69 after a relatively long struggle with pneumonia. He is buried with his wife, Felipita Lopez, in Rosario Cemetery in Santa Fe.